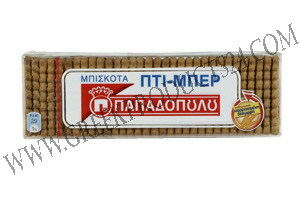 PAPADOPOULOS PETIT BEURRE biscuits still own the first place in our hearts thanks to their original, unique taste and they are the favorite biscuit of all ages. Apart from their delicious flavor, they are also nutritious, since their recipe is based on cereals and they constitute a very good suggestion for breakfast or any time of the day, in the framework of a healthy diet. Moreover, they can serve as a snack or part of a snack (please see examples below). They are rich in carbohydrates, nutrients that are necessary for maintaining a healthy body, and they help us sustain our dietary balance on a daily basis. In addition to the classic taste, PAPADOPOULOS PETIT BEURRE biscuits with whole grain flour are also available and offer even greater nutritional benefits, since they are whole grain products and contain bigger amounts of fibre as well as complex B vitamins. 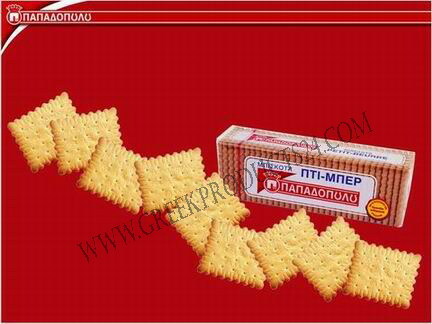 PAPADOPOULOS PETIT BEURRE biscuits with whole grain flour are a contemporary and innovative product, compatible with the modern dietary needs. Their content in dietary fibre is 4.5g per 100g of product, an amount that can contribute to the recommended daily intake of natural fibre.